The author has brought to life the Forgotten Regiment, of the Forgotten Army, of the Forgotten War. Although historians are beginning to bring out the stories of the Burma campaigns, there is still so much to cover and to correct the news neglect of the campaigns at the time that they were taking place. This is therefore a very welcome new book and a fitting memorial to those who served in the RAF Regiment in the Far East. DESCRIPTION: The author has brought to life the Forgotten Regiment, of the Forgotten Army, of the Forgotten War. Although historians are beginning to bring out the stories of the Burma campaigns, there is still so much to cover and to correct the news neglect of the campaigns at the time that they were taking place. This is therefore a very welcome new book and a fitting memorial to those who served in the RAF Regiment in the Far East. It was perhaps natural that British news coverage of the Far East campaigns was so muted. The reverses in the outposts of Empire were painful at the time and there was so much to cover on the domestic doorstep. The Far East was just so far away. The RAF Regiment was established to defend RAF airfields. That meant that it had to be trained and equipped as any infantry regiment in the British Army and also trained and equipped as an anti-aircraft artillery force to tackle threats from the ground and from the air. However, it was confined in its movement. Any Army regiment needed to advance and retreat while engaging an enemy force. Rear guards would buy time for the main force in a retreat, but the Army was expected to engage and advance, or provide a static shield. The RAF Regiment arrived at an airfield and was then expected to hold that position and protect aviation assets against air and ground attack, including small determined raids by Special Forces. Even advanced airfields were generally some way behind the front line. That became more complex in Burma because of the nature of fighting and local conditions. By the start of WWII, aviation had come of age and formed a valuable and vital part of the combined arms deployed against the enemy. That was even more true in Burma because large Special Forces groups operated far behind the Japanese lines and could only survive and succeed with significant air support in the form of supply drops, glider and paratroop forces, air observation, and close air support. The RAF regiment was therefore a small, and under-equipped, force that performed a vital role in ensuring aviation assets survived and operated at optimum level. 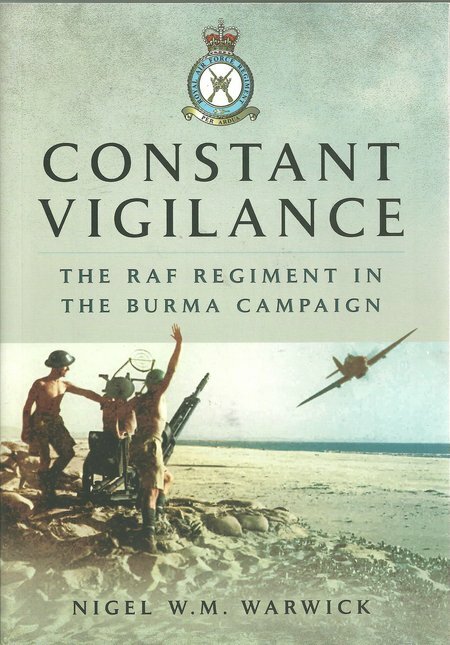 The author has made use of personal records and accounts from RAF Regiment personnel. The text is strongly supported by maps, diagrams and photographs, many not previously published. This book is strongly recommended.